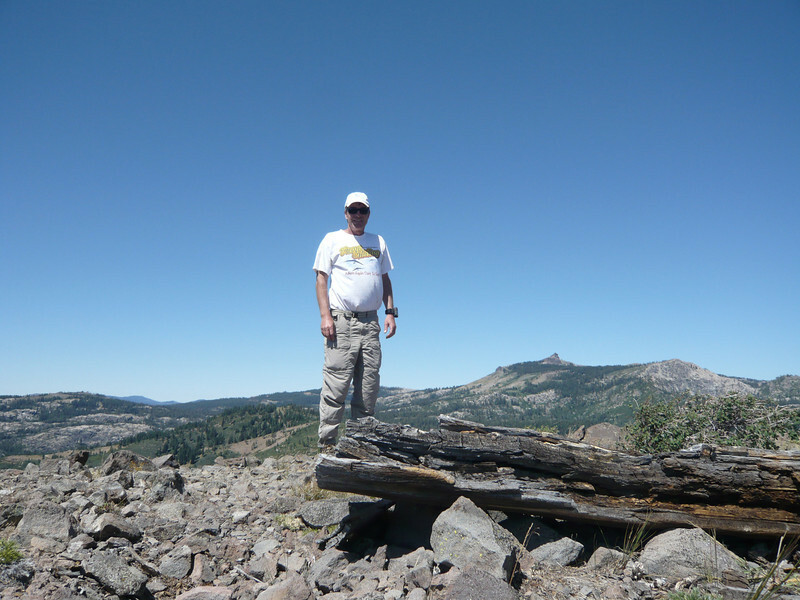 Standing at the summit of Donner Ridge with Castle Peak (W6/SN-038) jutting onto the skyline behind me and to the camera's right. The weather was perfect today for an activation. It isn't always, as Donner Ridge is named after George Donner, the leader of 87 brave pioneers who attempted to cross the Sierra near here in a wagon train back in 1846. Most of them perished just a few miles from where I'm standing due to an exceptionally strong early season snow storm. They were trapped below Donner Ridge in two different locations, with no way to continue westward across the Sierra or back down into Nevada, and resorted to cannibalism to try and stay alive until spring. A few of the stronger ones did manage to press on to the west and were eventually rescued. The rescue mission that was dispatched from the west found a handful more still alive down below the ridge. P.S. - My gut and legs aren't that fat, the wind is blowing from behind me and puffing everything out.